Which kinds of growth lead to increased employment and which do not? This is one of the questions that this important volume attempts to answer. The book explores the complex relationships between innovation, growth and employment that are vital for both research into, and policy for, the creation of jobs. Politicians claiming that more rapid growth would remedy unemployment do not usually specify what kind of growth is meant. Is it, for example, economic (GDP) or productivity growth? Growing concern over ‘jobless growth’ requires both policymakers and researchers to make such distinctions, and to clarify their employment implications. Edquist, C., Hommen, L., and McKelvey, M. (2001). 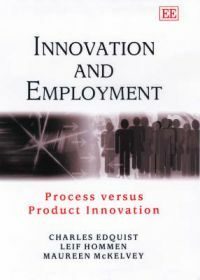 Innovation and Employment: Process versus Product Innovation. UK: Edward Elgar Publishing, Cheltenham, 214 pp.